“I must give credit where credit is due; it is the Roman Catholic sisters who have done the best work on the Magnificat,” said the Rev. 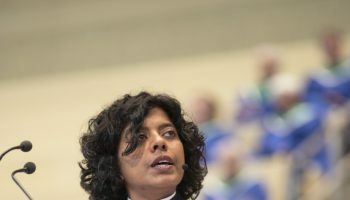 Winnie Varghese at the 9:15 a.m. Tuesday morning worship service in the Amphitheater on Aug. 21. “And if you think that these sisters are meek and mild, think again,” she said. Varghese’s sermon title was “The Songs of Our Humiliation,” and the Scripture text was Luke 1:46-55, the Magnificat. When she was rector of St. Mark’s Church-In-The-Bowery, the congregation used “Canticle of the Turning” during Advent. 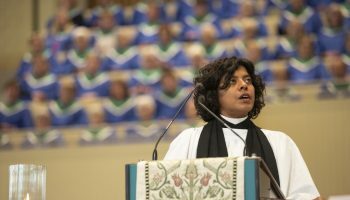 Varghese was asked to be a worship leader for a conference of Episcopal bishops. When, in the service, the congregation got to the “Canticle of the Turning,” one of the bishops took the lead. The more he led, the louder and stronger the hymn became. This, she said, is how a song of freedom becomes a song of conquest, with its strong beat and volume of singing. 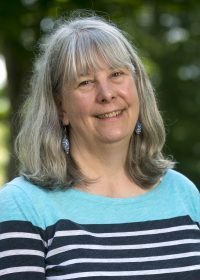 The “Canticle of the Turning” is “a song of aspiration, of the heart and tenderness,” she said. In the Magnificat, Mary praises God because he sees her lowliness. Mary claims her dignity for herself, which is revolutionary. Varghese said that the Magnificat has a long history of being banned in some political situations. Its call for earthly power to be brought down is not subtle. It was banned in India during British rule, in Guatemala in the 1980s, and by the Argentine junta in the 1970s and ’80s. Singing the Magnificat is a must at Episcopal evensong services. 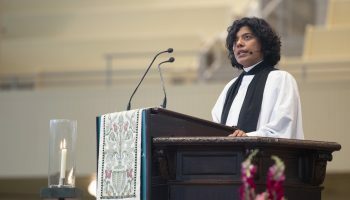 Varghese was part of a service at Union Theological Seminary in New York in the fall of 2014, after Michael Brown was shot in Ferguson, Missouri. Union has sent out generations of activists, she said. “Believers in every generation at Union know the world is changing and want to be a part of the change,” Varghese said. The James Chapel at the seminary was filled. Some of the students had been in Ferguson. Some had heard stories similar to Brown’s all their lives about family, friends and neighbors. 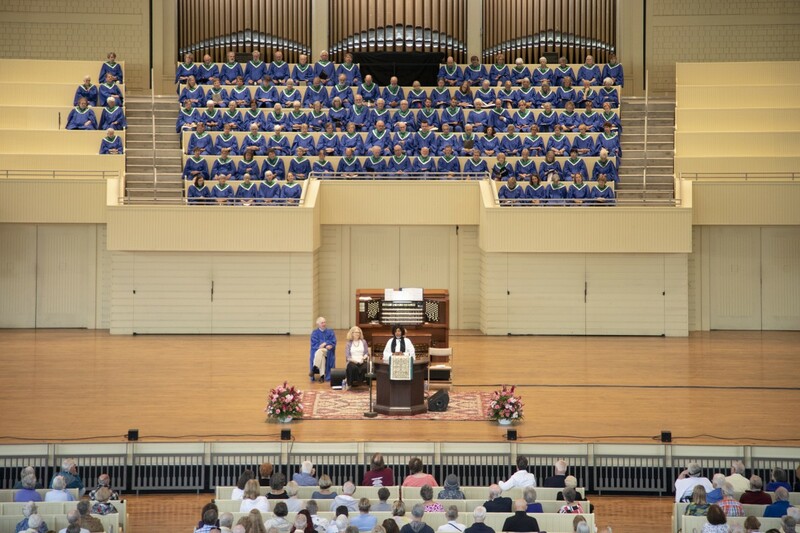 Varghese had expected quiet restraint, but people wept loudly during the service. At one point, she said she wished a black, Pentecostal preacher would fill the room with powerful words. Then a young black man got up, walked toward one of the pillars in the chapel, and began a low wail. “It was the deep moan of Mary and the women with tears that called down the hand of God for comfort,” Varghese said. The principalities and powers are still at work today, Varghese said. In November 2014, a jury decided not to indict the police officer who shot Brown. Varghese sent a text message to the people of St. Mark’s that they would meet at the church the next morning. There were plenty of people to help, so one of the young black men who was there said he would go help the other churches with their banners. He came back several hours later, confused that St. Mark’s seemed to be the only church making a banner. 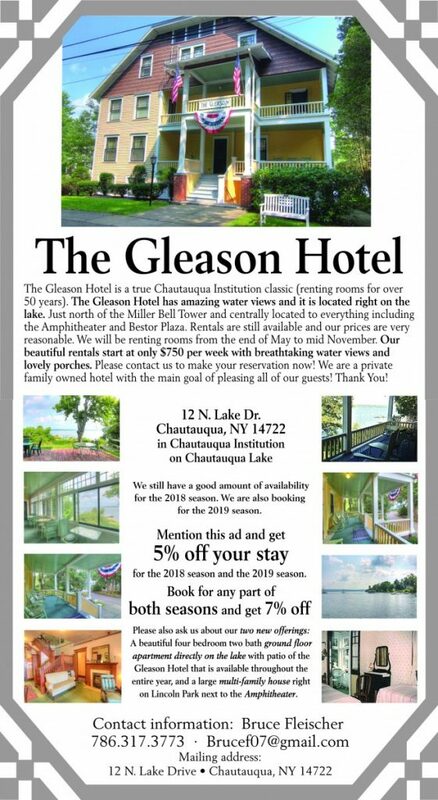 The banner was 24 feet long and 3 feet high. They hung it from the historic fence at the church with grommets and zip ties. St. Mark’s is on the corner of East 10th Street and Second Avenue in Manhattan — a big, public intersection. The next morning, the banner was gone. No one saw a thing. Mary’s song, the Magnificat, is a wail so deep we try to turn away, she said. It was a recognition of the life children like hers would have in the empire. The Rev. Virginia Carr presided. 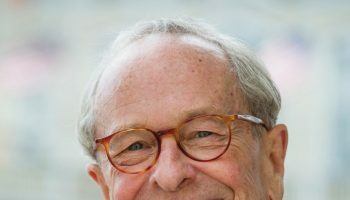 Bill Waterston, a retired Baptist minister who served American Baptist churches as a magazine editor, director of radio and television ministry, and a child care executive, read the Scripture. 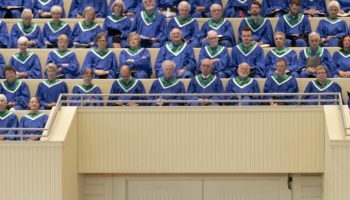 The Motet Choir, under the direction of Jared Jacobsen, organist and coordinator of worship and sacred music, sang “Alleluia” from “Brazilian Psalm” by Jean Berger. 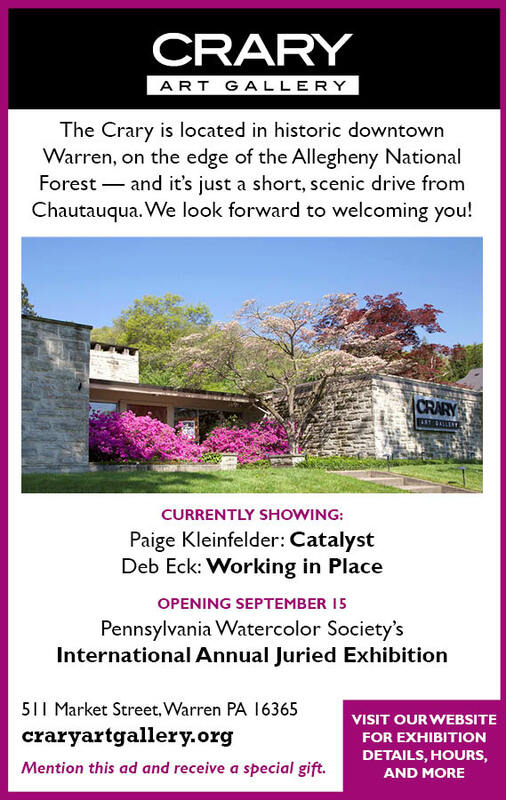 The Mr. and Mrs. William Uhler Follansbee Memorial Chaplaincy and the Daney-Holden Memorial Fund provide support for this week’s services.